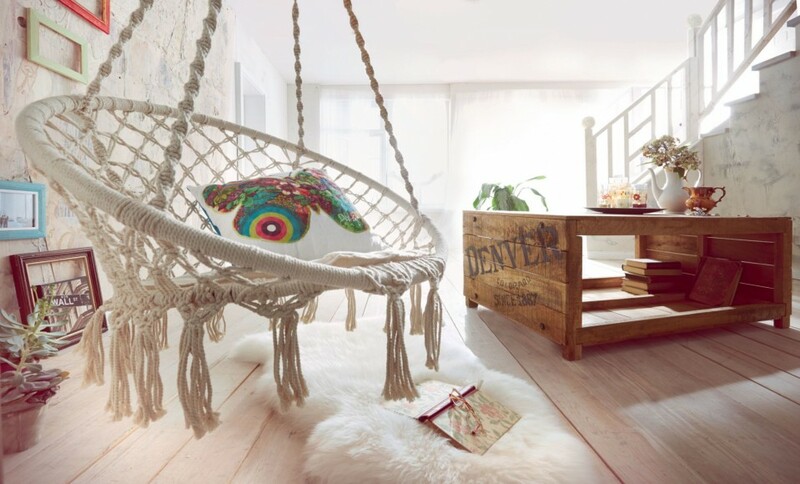 Indoor swings offer a really simple and convenient way to have a touch of outdoor fun in your indoor space. You get a fun piece of furniture that is not only functional but also super aesthetic. So if you have been wondering what the missing centerpiece to your perfectly decorated room is then here is your answer – a hanging chair. 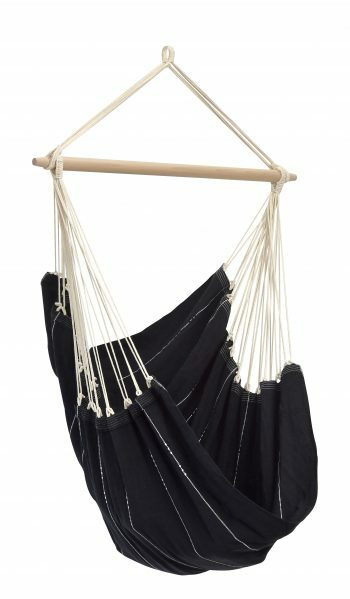 Having a macrame hammock swing chair can and will make the world of a difference to any space. Click on the image to read the review. 1 What will you need for hanging your chair indoors? What will you need for hanging your chair indoors? First thing’s first, you need to figure out what will be the supporting structure for your swing. In this case, there are usually just two options; stands and suspension systems. These usually come with the chair but in case the items are not included, you can very easily acquire them yourself. Each option has a lot to offer in terms of installation, functionality and physical appeal. The choice is entirely yours depending on your vision for the swing and the space. Below is more on what both have to offer. Stands are meant for setting up the swing chair on the floor. More often than not, they have curved frames. This design affects the space consumed making it a factor seriously worth considering. If you have room for it, there is a lot to look forward to including easy installation and high stability. They also offer the advantage of portability where you get to move it to another room or within the same room when you decide to renovate. This option requires that you set up the swing by attaching it to the ceiling or exposed roof beams. It goes without saying that installation here is a little more complicated. However, the final result makes all that ladder climbing and continuous drilling worth it. It offers a unique aesthetic and is definitely worth considering if you intend on having the chair as a décor centerpiece in the room. Here you can find our recommendation for the best hanging chair suspension kit. So how will you make your indoor swing chair homier and… well, indoor-appropriate. The answer is simple; you need to accessorize. Here, it is important to consider things like the interior décor theme in the room where the chair will be set up. It is also important to factor in the chair’s comfort features in order to figure out whether or not you need to make some additions. 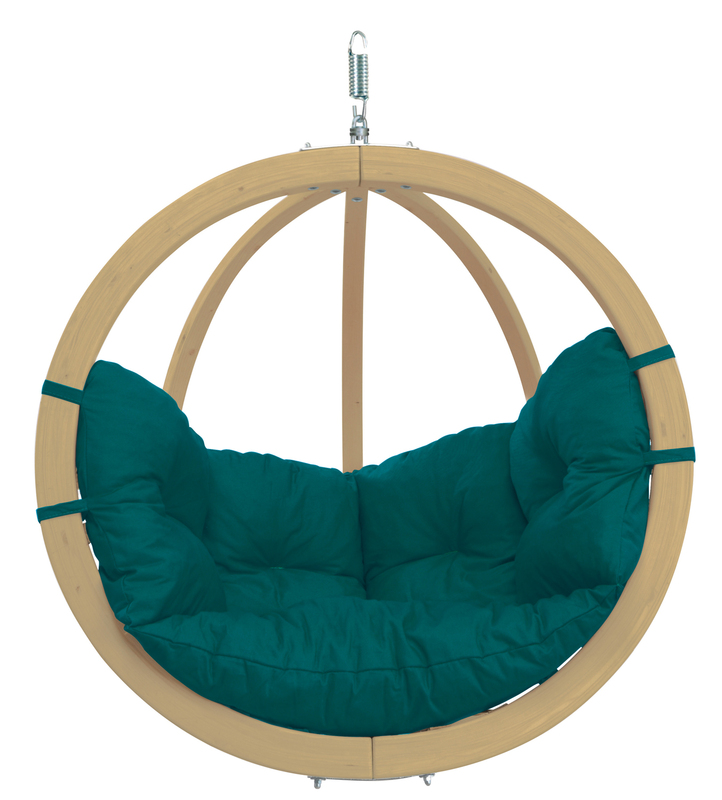 Either way, here are a few indoor swing chair accessories you can never go wrong with. Most swing seats come with a cushion on the seat. Some are padded all around which makes them even more comfortable. If this isn’t the case, you could get some that fit the chair. Pillows also help make the seat look and feel a lot more comfortable. If you get one of these chairs you will most likely spend a lot of your time there. So why not turn it into a self-sufficient unit where you do not have to keep getting up? One of the best ways to do this is by including cup-holders. This is particularly easy to do if the chair has arm-rests. But believe it or not, there is a hammock chair with a drink holder. A throw rug or quilt is another great accessory that is always nice to have. It keeps you nice and toasty so you can better enjoy your time on the swing. Finally, if you wish you could get a footrest. These come in handy with C-shaped or egg design chairs that often lack a place to place your hanging feet. How To Install a Ceiling Chair? Click on the image to learn more about. Here, you consider the maximum supportable weight both for the swing and the suspension system or hook you are using. The important thing is to ensure that you find a really stable spot that will not easily give way when weight is applied. Before you even pick up a drill driver or a screw you need to familiarize yourself with the manual. This is because despite all the tutorial videos or DIY guides you read the swings brands are never the same. Reading also helps you ensure that you have all the small installation that you need. These go straight onto the ceiling. Suspension plates often have drill holes and corresponding screws. All you have to do is fit the screws and drill them in. 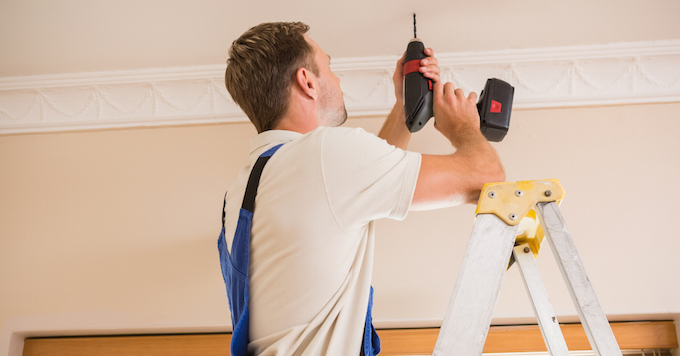 The hooks are usually secured by drilling directly them into the ceiling. Once the base support is attached, you can now install the swing using the ropes. This is usually the easy part as most swings come with hooks for easy attachment. Before you sit on the swing make sure it is actually secure. You can do this by applying some downward pressure with both arms to see whether or not it gives way. Then you can sit down and if the roof doesn’t come crumbling down start enjoying your new treat. Macrame Hanging Chair by Hang A Hammock Collective. Click on the image to read the review. This breaks the monotony of traditional furniture. It also allows you to enjoy the chair without being left out of fun conversations or even simple family hangouts. This feels like comfort on comfort. 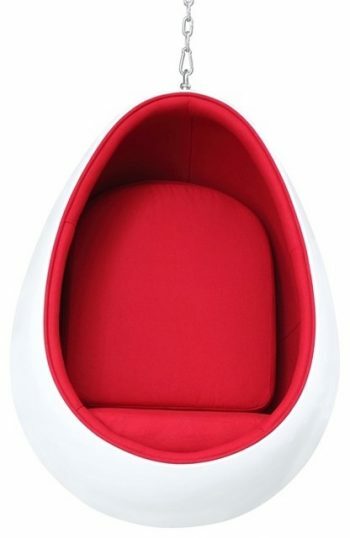 The chair gives you an equally comfortable spot to relax when you do not really want to lie on the bed. It is also a really great place to read and unwind. Still not sure you want a hanging chair in your bedroom? Here are the Five Reasons Why You Should Have a Hanging Chair in Your Bedroom. Swing chairs with floor stands are great for offices. They are fun, casual and comfortable without interfering too much with the serious vibe of in these rooms. Setting it up here means you have somewhere to take quick breaks from work without having to get distracted by what is happening around the house. Kids love swings and having one indoors will be like having Christmas every single day. 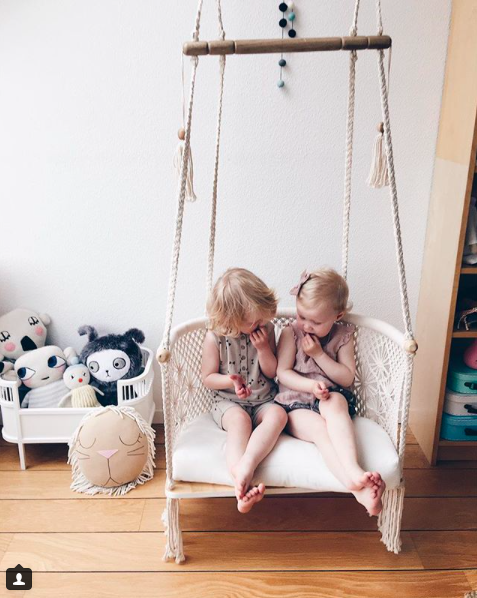 There are thousands of reasons why to buy a hanging chair for kids. But let’s start with 7 Reasons to Hang a Hanging Chair in Kid’s Room. For safety and longevity, it is best to go with those that have firm floor frames. This is because children can get a little too wild for your ceiling to handle.